This tract tells our increasingly secular culture about Jesus and why He came. Order this item if you only need 50 copies. If you need additional copies, add item 210000 to your cart. If you select more than one pack of this item number, we will only ship one pack for free. Why is baptism by pouring preferable? An easy-to-read look at Scripture, history, and practical issues. A practical tract promoting tract distribution. An appeal to women to dress according to principles of Christian modesty and decency. Confirms God's loving care and His desire to indwell us and direct our lives. A careful explanation of God's plan of salvation. Emphasizes the necessity and blessing of confession and forgiveness. 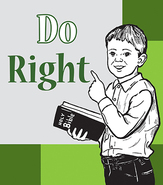 An activity tract for children, encouraging them to always do right. Prepare now for eternity with the Lord. Excellent evangelistic tract. The effects of guilt and the hazards of pagan solutions—and God's solution. Carefully outlines the warning, the hope, the cure, and the method—the latter in ten triumphant steps. Urges non-Christian youth to heed God's warnings on the highway of life. Many special passages for special needs. Inspires love for the Bible. A converted prisoner explains that true freedom is found by yielding to Christ. Excellent for prison ministry. Should Christians be involved in Halloween activities? This thoroughly researched and objective look at Halloween's pagan history and practices clearly answers the question. With words and color pictures, this 16-page tract presents Jesus as the bridge between God and man. Especially designed for one-on-one witnessing. Order this item if you only need 50 copies. If you need additional copies, add item 210369 to your cart. If you select more than one pack of this item number, we will only ship one pack for free. Repentance: a holy horror of sin, and a sincere forsaking of it in surrender to God. Compares human reasoning with God's perspective. Graphically depicts the self-righteous as deserving the death penalty if he has rejected God's only pardon. An introduction to the most wonderful Friend of all. How can one know the right way to Heaven, in view of countless religions?